This is FRESH AIR. Back in the 1960s, when teenage girls in America and England fantasized about romance with their favorite Beatle, Cynthia Powell Lennon was in the position so many girls dreamed of. She was married to John. Cynthia Lennon died yesterday of cancer. She was 75. Cynthia and John shared a working-class background. They met in art school in 1957 and were married in 1962, just weeks before The Beatles recorded their first single, "Love Me Do." During the years that John toured the world as a member of the most popular rock group in history, Cynthia was at home raising their son, Julian. Cynthia and John Lennon divorced in 1968, after John fell in love with Yoko Ono. John Lennon was assassinated 12 years later. 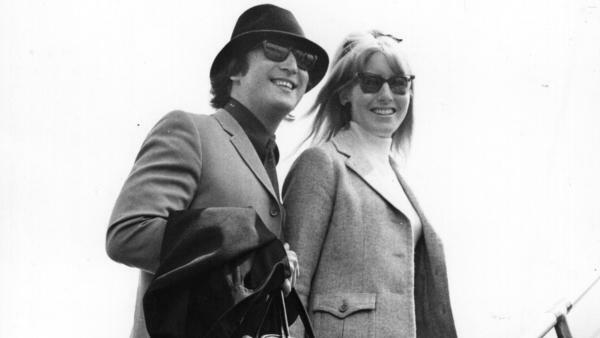 Cynthia Lennon remarried several times. As her son, Julian, launched his own music career, Cynthia developed her work as a designer. I spoke with her in 1985 about what it was like to be married to John during the time The Beatles became a music phenomenon. GROSS: You were told by Brian Epstein after a while, The Beatles' manager, that you shouldn't be too visible as the wife. They didn't want the fans to know, I think, that Lennon was married. Or, at least, they didn't want to play it up. I mean, how were you told that? Did he tell you that directly? CYNTHIA LENNON: Well, he didn't exactly tell me. But he did speak to John about it. And, of course, John explained to me the situation because in those days, it wasn't done for a pop star to have a wife. It would take away from the group. And, of course, the beginning of The Beatles, Brian wanted a lot of adulation from the fans. He wanted a lot of support from the fans. And, of course, it wasn't done. If the lead - in fact, the main man in the group, who was John - was found to be married, then it might take away from that particular success. So I walked around pregnant for quite a long time, hiding it. You know, I'd wear very big, blousy clothes. And I was asked many times if I was John's wife. And I had to refuse and say, no, no, I'm somebody else. GROSS: What was it like in the days when you were a young mother and John was mostly on the road touring? And he'd have, I guess, like a couple of weeks here and there in between tours to come home and play the role of husband and father. Was he able to make that transition from rock star and figure of fantasy to young father and husband? LENNON: Extremely difficult for him because even though - when he wasn't on the road touring, he was in the recording studio. So we saw very little of him. And when he did come home, he was so exhausted and so tired and so overwhelmed by the pressures of the outside world, that when he came home, all he wanted to do was to collapse. And he used to sleep an awful lot. And he would wake up when we were ready to go to bed, if you know what I mean. With a small child, you have to be up early in the morning. And then you're pretty exhausted at night, whereas John's hours changed. You know, he'd be up at night and in bed during the day. So the whole fabric of our life changed because of the work that he was doing and because of the pressures from outside. GROSS: Were you able to maintain a private life of your own? LENNON: Well, my private life was with friends, I suppose, the friends that I'd known from college days that I kept in contact with. I frequently went back to my roots, which was in the north. I mean, we moved down south. And I had Julian, who I loved dearly and cared for him most of the time - well, when I was there. You know, I'd sometimes go away with John on holiday. But the problem with me was that I had to cope with a household. I mean, we moved into a virtual mansion, you know, as soon as the money came in. We needed the space. So the first thing to do is - if you're a pop star and you get a lot of money, you buy a mansion. That takes you from one extreme of life to another extreme. And John being away, the house is far too large for me to handle on my own. So all of a sudden, you find yourself with a chauffeur and a housekeeper and a cook and an interior designer. And all the things in life that you've never experienced before and you weren't brought up to, I was left to cope with and handle, which was hard work. It was a full-time job, actually. GROSS: Did you want to go on the tours, ever? LENNON: Well, I was allowed to go on the first tour - allowed, and I mean allowed. But I didn't ask. John - I think John wanted me to go because it was so exciting to come to America for the first time. I'd never been to America, and it was a treat for me. It was really a fantastic experience. But that was enough. I wouldn't want to have done it again. It was just too much. GROSS: What - you mean being on the tour was too much? LENNON: It was just understanding and seeing what went on on a tour. It sounds extremely exciting. It sounds wonderful, you know, different hotels and wonderful food and seeing new places. But all we saw were the inside of hotel rooms, the inside of Cadillacs. We were surrounded by mounted police on one occasion, motorbike escorts on another occasion, trying to escape from hotels. It was quite horrendous. Apart from the actual performances, which were fantastic, the rest of it was horrendous because you couldn't see beyond the prison that you were in at that particular time. GROSS: Were you exposed to any of the groupies who were hanging around John Lennon and the other Beatles then? LENNON: Well, actually, the first experience, which was funny for all of us when we first came to New York and we were staying at The Plaza... And I think it was Murray the K who was there. He was the first disc jockey that we'd ever met - American disc jockey - and so I was very impressed. But he happened to be there. And in the room, there were sort of all these draped, beautiful ladies. This was their suite, Murray the K and about five beautiful, model ladies all draped around. And we all walked in and looked at them and looked at each other and wondered what on earth we were supposed to do in a situation like this because it was obvious, you know, what they were there for. And, of course, I was the fly in the ointment because I was the wife of one of The Beatles. So it was embarrassing for them and embarrassing for me. And it was a situation that clicked with me. I mean, I realized then what it was going to be like, you know, in the future. I mean, obviously, that was what it was going to be like, just women throwing themselves at them the whole time. GROSS: We're listening back to my 1985 interview with Cynthia Lennon. She died of cancer yesterday. We'll hear more after we take a short break. This is FRESH AIR. GROSS: This is FRESH AIR. We're remembering Cynthia Lennon, who died yesterday at the age of 75. We're listening back to my 1985 interview with her. She married John Lennon in 1962. They divorced in 1968, after he fell in love with Yoko Ono. GROSS: How did you first meet Yoko? LENNON: I met her - oh, where was it? - actually, when I came home from a holiday. But I had seen her before. I mean, I met her physically, you could say. And she'd been staying with John the night. And I came home, and they were there, which was sort of curtains for our marriage as far as all of us were concerned, really. But I had met her once before at a meditation meeting. GROSS: You knew right from the start, when you saw them together, that this was it, that this was different from just having an affair with someone? LENNON: Well, I keep saying it was feminine intuition. You know that something's going to happen. And only you know that something like that is going to happen because of your sensitivity and your knowledge of the person that you've been living with for 10 years already (laughter). You know exactly what's going to happen. And as far as Yoko is concerned, I knew there was not a thing I could do about it any more than there was anything I could do about John taking drugs at the time. There was no way I could have stopped him. GROSS: He initiated divorce proceedings, right? GROSS: And he accused you of adultery. LENNON: Well, you see, this is the crazy - the madness of it all. I, to this day, don't understand that. But it's almost as though - I've tried to work it out. It's almost as though John's attitude in life was the best form of defense is attack. Now, he was guilty of letting me down in public. And I went - I was on holiday when the information about John and Yoko came out in the newspapers. I didn't know it was open to the world, this situation. And I was on holiday, and somebody showed me a newspaper. And then, an emissary of John's came over to visit me in Italy and said, John wants a divorce; and he wants Julian, and there's a detective. Now, I was staying on - I was on holiday with my mother, my aunt and uncle and Julian. So God only knows why there was a detective put on me. You know, it was one of those situations that I will never understand. GROSS: When John and Yoko went off together, their relationship was probably the most covered - press-covered relationship of the year. They were on the cover of everything. They were holding press conferences in their bed. I mean (laughter) it was one big media event after another. How much of yourself - how much of that did you want to expose yourself to? Did you read it? LENNON: Oh, I read everything, yes - because, of course, the man that had - we had divorced. It didn't mean to say I didn't - had stopped loving him or caring for him or worrying about him, I mean, because I didn't have any anger or bitterness about it. I had a lot of hurt. But, of course, I was looking after his interests in my own little way and caring about his future and hoping that he was happy - 'cause he'd had to go through such hell to do what he did. And he became almost a leper in the eyes of the British and the press. And he had hell to go through because he broke away from the system of being one of the four mop-tops that were doing so well and such good ambassadors for Britain. And he moved out of that, and he became an individual. And I felt extremely worried for him really at that time because he had to take so much from the press and media. GROSS: How do you think his personality was changed by the relationship? LENNON: I think he found his space. I didn't - I don't think he found the complete satisfaction in life because I think he was always searching, always looking for it, always wanting something new, always... I mean, he was due to come back to England, you know, near the end of - just before he died. But whatever he did, it was totally honest and wholehearted. GROSS: Did you hear about his assassination through the press, or did someone notify you before it got out on the wires? LENNON: Yes, I was staying with Maureen Starkey at the time. And I had - she had a phone call from Ringo to tell her, so she told me. GROSS: Julian Lennon, who has a hit record and is, you know, becoming a rock star himself. Did you want him to be in the rock world? Did you have (laughter) any queasiness about that? LENNON: Not at all. No, I encouraged him. LENNON: Well, I didn't - I didn't push him. But I encouraged him because that seemed to be the only thing that he really wanted to do in life. That was the only direction he seemed to want to go in. You know, he would've been hopeless anywhere else, very much like his father in the early days, because academically he wasn't bright - or wasn't interested, for a start. But he was artistic and musical. And, of course, if you see just a spark of enthusiasm in a child, then you will encourage it. And what has happened has been a revelation to me in such a short time. GROSS: A lot of people have remarked about how much he looks like his father and how he even sounds like him. Do you find that eerie? LENNON: I did - I think following John's death, I had an experience of coming downstairs in the house that I lived in in North Wales. And he was sitting at a piano with his back to me. And he was singing a very soulful song. And I had to do a bit of a double take. It was a very strange feeling, really spooky. But from that moment on, no - no because Julian is his own man now. And I went to see him in Los Angeles last week, performing for the first time. And I was really worried because I thought, what is this going to be like? It's going to be really emotional and highly charged. And I thought, well, I'll have to take a box of Kleenex with me because I'll be, you know, blubbering all the time. But I watched him, and, you know, I was so proud. I didn't shed a tear. It was so - such a happy event and a joyous event that that boy has come out of a lot of tragedy and a lot of upheaval in his life and is giving his heart and soul to something that I think is wonderful, which is music and its communication. And I was so proud and so joyous about the occasion. GROSS: Cynthia Lennon, recorded in 1985. She died of cancer yesterday. Her son, Julian Lennon, was at her bedside. We'll close with his recording of a song he co-wrote with Steven Tyler called "Someday." STEVEN TYLER: (Singing) How does it feel to be one of the beautiful people? JULIAN LENNON: (Singing) Say a prayer and close your eyes someday, someday. Hope and pray we get it right one day, one day... Transcript provided by NPR, Copyright NPR.